This article is about the automobile brand from 1899 to 1910. For the automobile manufacturer from 1916 to 1924, see Columbia Motors. Columbia was an American brand of automobiles produced by a group of companies in the United States. 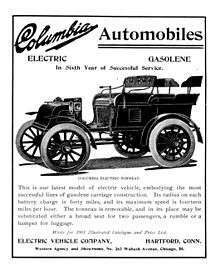 They included the Pope Manufacturing Company of Hartford, Connecticut, the Electric Vehicle Company, and an entity of brief existence in 1899, the Columbia Automobile Company. At the turn of the Twentieth century they were producing and selling hundreds of vehicles a year under Pope's Columbia brand name, while most gasoline engine automobile manufacturers had made only a few dozen. In 1908, the company was renamed the Columbia Motor Car Company and in 1910 was acquired by United States Motor Company. A different Columbia Motors existed from 1917 to 1924. The 1904 'Columbia Brougham' was equipped with a tonneau. It could seat 4 passengers and sold for US$3,500. Twin electric motors were situated at the rear of the car. Similar 'Columbia' coupes, 'Columbia Hansom' cabs, or hansoms, were also produced for the same price. They could achieve 13 mph (21 km/h). A 'Columbia Victoria Phaeton' was priced at US$3,000, but was based on the same design. 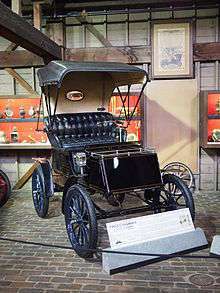 1903 Columbia Electric Runabout, the best-seller car in the U.S. in 1900 and the first to exceed 1000 sales. The 'Columbia Surrey' and 'Columbia Victoria' were more traditional horseless carriages. Both used the same power system as the larger cars, with twin electric motors, but cost much less at US$1,500 and US$1,600, respectively. At the bottom end of the range was the 'Columbia Runabout' car. Priced at just US$750, it used a single electric motor, with an Exide battery and Concord springs. Columbia's basic runabout was typical of the time, resembling a horseless carriage, and was steered via a tiller. It cost US$850, US$200 more than the contemporary Curved Dash Oldsmobile. The 1,200-pound (540 kg), single bench seat vehicle had a wheelbase of 64 inches (1,600 mm), and rode on 30-inch (760 mm) wooden spoked wheels, with leather fenders. The drivetrain had clear evolutionary roots in Pope's bicycle business, driving the rear axle via a chain drive, producing virtually the only operating noise. Between the motor and the chain drive was a transmission with three forward and two reverse speeds. Twenty batteries manufactured by Exide Batteries, also associated with Electric Vehicle Company, were placed above both axles in order to balance the weight. Brakes on both rear wheels featured a bell, which rang when the vehicle reached a full stop. Top speed was about 15 mph (24 km/h). Besides the runabout, Columbia manufactured about 20 other models including taxis, police cars, and buses. The vehicles were most popular in cities, where relatively smooth roads made the electric motor, with its smoothness and silence, appear superior over the gasoline engine. It helped in urban areas that electrical supply for recharging was easily found within the runabout's 40-mile (64 km) range. 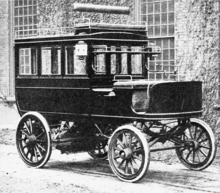 Nevertheless, in 1903, a Columbia was driven 250 miles (400 km) from Boston to New York City in 23 hours. In keeping with this urban orientation, the Columbia was positioned as a high-end vehicle, with its showroom across the street from the Metropolitan Opera House in New York. The Columbia Touring Car was an entirely different car. 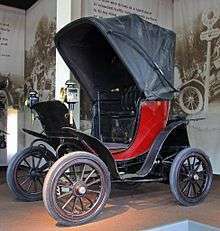 A touring car model, it used a tonneau, seating 6 passengers, and resembled the touring models offered by many other companies at the time. Priced at US$4,500 to US$5,000, it used a vertically mounted straight-4, situated at the front of the car, producing 24 hp (18 kW) . A 4-speed sliding transmission was fitted. The car weighed 3,000 lb (1,400 kg) . One design innovation was the "false frame" supporting the engine. A Knight sleeve valve powered model was added to the range in 1912 and 1913. Brooks Brierley (November 6, 2006). 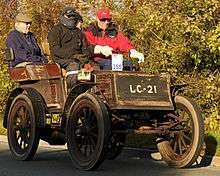 "1903 Columbia Mark LX Electric Runabout". Autoweek Magazine. "Electric Carriages". Frank Leslie's Popular Monthly: 373. January 1904. Wikimedia Commons has media related to Columbia Automobile Company.